It’s been almost 10 year in 2016 I started playing with WordPress. WordPress is pretty amazing with lots flexible and customization options with the help of hooks/filters it supports. As per latest information (as of March 2016) WordPress powers and nominates to top 26% of the web sites. That’s not only amazed us but tells us how powerful the framework is. One of the beauty of WordPress is about expandable Plugins and Themes support. On top of WordPress core, there are so many companies who built theme frameworks. 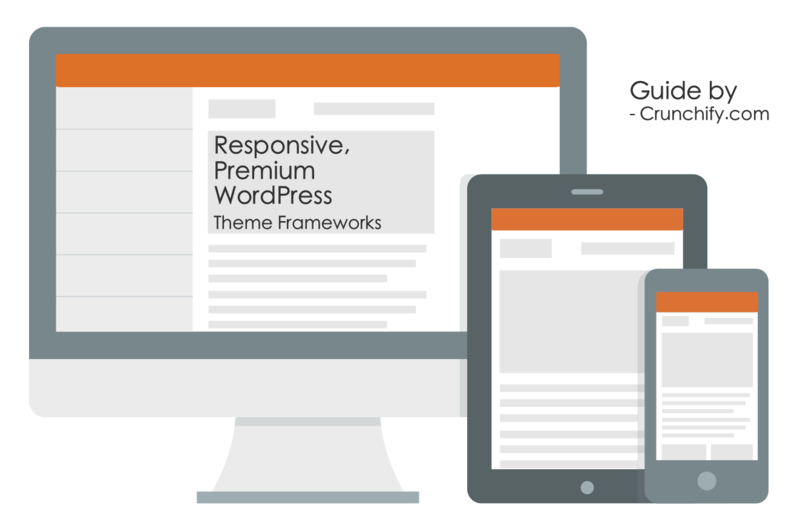 In this tutorial we will go over why we need theme framework and top responsive & premium WordPress theme frameworks. In general a framework is a standardized set of concepts, practices and criteria for dealing with a common type of problem like Site/Blog layout. Basically in my opinion, Responsive web design represents a fundamental shift in how we’ll build websites for the decade to come. Below are my favorite responsive frameworks. I don’t think you need any more framework to look. Take a look, decide and let us know which one you prefer. On Crunchify, we are using Genesis Framework and Eleven40 child theme. Genesis has a straightforward pricing scheme. You pay $59.95 once and get lifetime access to updates and usage on an unlimited number of websites. It’s been so many years with Genesis and I’m loving it so far. I’m thrilled with Genesis and now I’m ready exclusively to build websites for others. Search Engine Optimized: Google will love you! Schema.org support, mobile responsive, etc. Social Proof: All of the big sites are using Genesis. If you are serious about your business or building professional websites for others, I highly recommend it! Divi is the smartest and most flexible theme in our collection. Divi is the Ultimate Multi-Purpose Theme fit for just about any occasion and powered by the Divi Builder. It’s the only theme you will ever need. Divi Builder is a core component – it has drag and drop support for your theme. Headway Theme is a famous drag & drop Framework makes it super easy to start drawing out your website by creating your different blocks. Headway is a standalone, parent theme for use with WordPress.org installations (self-hosted). You simply draw out the blocks and then select which one to display. The responsive features frees up a lot of time spent coding as it offers many solutions for common problems us designers face when converting a desktop website to a mobile one. Let me know which one is your favorite one. Magazine Premium WordPress Theme – No Comment Template on Page? I appreciate your post! I am a front-end developer and web designer. I am going back to the drawing board to reassess my work flow and am wanting to start building my websites with the Genesis framework. I highly prefer using SASS for the nesting, variables and mixing and am looking into a way to integrate a fluid CSS grid system into Genesis as well. I noticed in your profile at the bottom of the page that you are a Genesis expert so I was wondering what you recommend for integrating Genesis with a CSS framework and using SASS with Genesis. I have worked with Bootstrap on a couple of sites, but I feel like it is sometimes more work than I need it to be with all of the classes. There doesn’t seem to be much on the Genesis support forums or their docs relating to this topic, it doesn’t look like it is as much a CSS framework.